From the mid to early 1970’s a new breed of cars ruled the American streets. The majority of these were intermediate sized automobiles with large block engines stuffed inside. At first these cars were called “super cars” and over time they became know more accurately as muscle cars. The quarter mile was the performance standard and weekend drag racing became very popular. Many of these cars pulled weekday duty as commuter vehicles, taking their proud owners to work and school. But, on the weekend the guys at the wheel were full fledged “amateur” dragsters. For the first time (and many would argue the only time) in American automotive history, high performance vehicles were available to the masses. The average Joe with a decent job could go to his local dealership and drive away with a ground pounding, tire smoking muscle car. Additionally, in a time before complicated emission controls and computer chips, an average Joe could actually working on his pride. As the list of the twenty fastest muscle cars points out, the majority of the beasts had domesticated roots. The Road Runners, Chevelles and Chargers were all basic family cruisers. What made them special was those wonderfully powerful big block engines. Even the Camaros and ‘Cudas were decent transportation for the young man with a couple of small children. 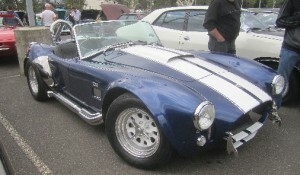 Only the Corvettes and the Cobra were initially created as sports cars. As everyone over this generation knows, the muscle car became extinct in the early 1970’s. Rising fuel costs, rising insurance premiums and new safety concerns marked the end of this era. Today the original muscle cars are one of the hottest automotive collectables. Men of a certain age are aggressively bidding for the car of their youthful dreams. So take a look at the list and see who really owned the streets when muscle cars reigned supreme. For more information about all the great Muscle Cars of the past visit Muscle Car Facts.